Coverage of the Olympic Games is evolving to meet bigger audiences in better ways. Sport broadcast has always been an early adopter of new tech. Fans want to be ever more connected to the action, and broadcasters are in an arms race to stay ahead of the competition. The Olympic Games is always in a balancing act when it comes to new technology. The diversity of Olympic events, the wealth of stories and the global nature of its audience, stretching out over a two-week period, offers unparalleled opportunities to reach viewers in new and better ways. However, the defining features of the Olympics brand are excellence and quality. Olympics coverage can’t afford a single technical hiccup and while a trial for a new online service may run beautifully in Seoul, you’re in for trouble if you expect the same results in Cuba. Olympic Broadcasting Services (OBS) was created by the International Olympic Committee in 2001 to be the Host Broadcasting organisation for all Olympics Games – Summer, Winter and the Youth Games. The organisation, headquartered in Madrid, is dedicated to a consistent broadcast approach across all the Games at the highest standards of production. 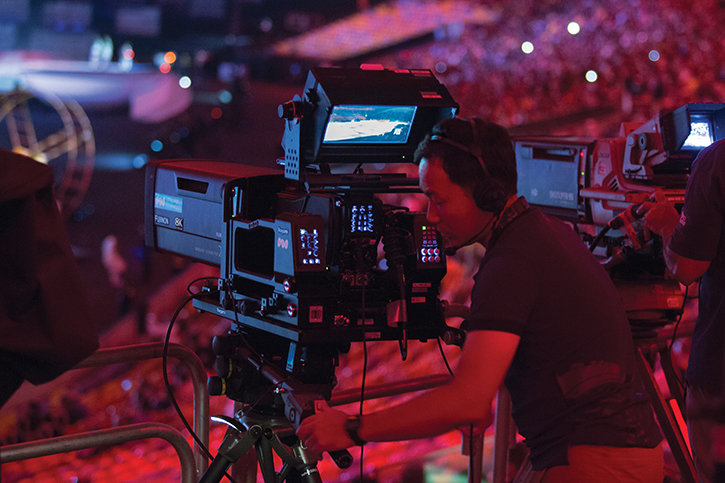 OBS produces all Olympics coverage, including providing the International Television and Radio (ITVR) signals of the Games, and designing, building, installing, operating – and dismantling – the International Broadcast Centre (IBC). Part of the OBS mandate is to adapt to meet the requirements of new technology. This year’s Winter Olympics in Pyeongchang, South Korea offered new opportunities for new platforms. “In the past decade, the growth of digital platforms, new technologies and cloud-based services have revolutionised the way the sports broadcast industry produces and delivers content,” says Sotiris Salamouris, OBS chief technical officer. Compared to the Sochi Winter Games in 2014, the variety of content produced at Pyeongchang was much wider, and content was pushed far more quickly and more efficiently in multiple formats to a variety of channels. Japanese broadcaster NHK produced 8K coverage for the opening ceremony, figure skating, short track speed skating, ski jumping and snowboard big air. 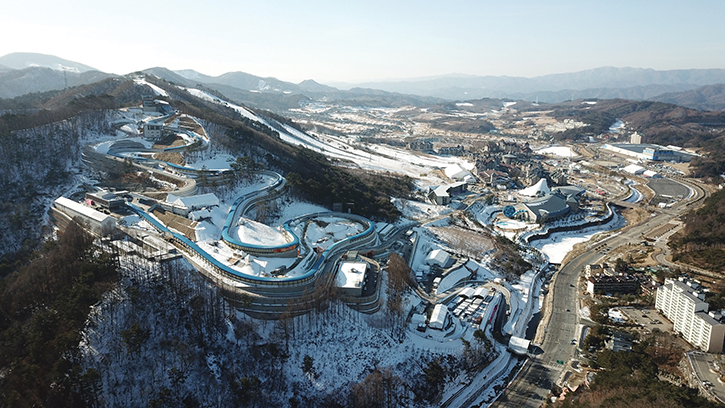 “At Pyeongchang, there were a series of new initiatives that were taken to facilitate RHB’s (Rights Holding Broadcasters) operations, especially on the digital front,” says Salamouris. “RHBs could receive the international signal over an IP network or use web-based file transfer solutions to send their footage back to their home countries, enabling them to run part of their operations remotely and with greater flexibility than in the past. PyeongChang 2018 was the most connected in the history of the Olympic Winter Games. International distribution was carried out through connectivity to five international points of presence around the world. Total outgoing capacity was several hundred gigabits per second, equivalent to the total outgoing Internet capacity of a small country. High-speed Winter Olympics events lend themselves to extreme coverage. Aerial and ground-level tracking cameras have become indispensable, allowing audiences to follow speed skaters or accompany cross-country skiers through gruelling miles. 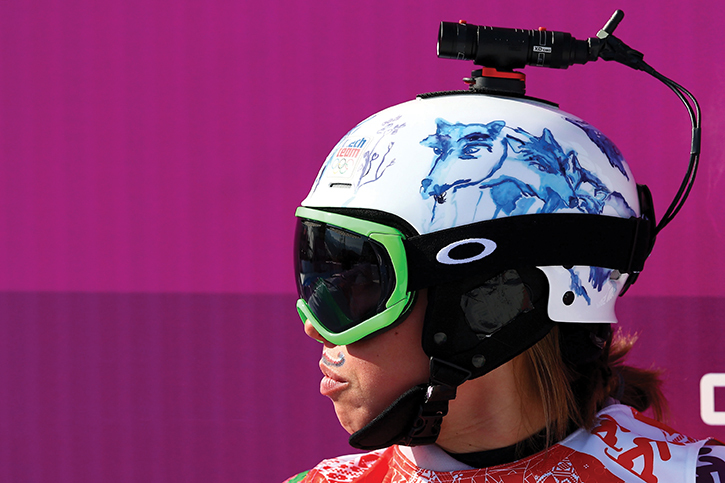 Helmet cameras on ski and snowboard cross started appearing in 2010, and in the 2014 Sochi Winter Olympics the first drones were used. Now the emergence of new technologies such as virtual reality are reshaping sports broadcasting. OBS offered VR and panoramic video production of selected live and recorded events to the RHBs, utilising an immersive, stereoscopic VR platform. OBS made significant adjustments to the VR/360 service after trialling it in Rio. 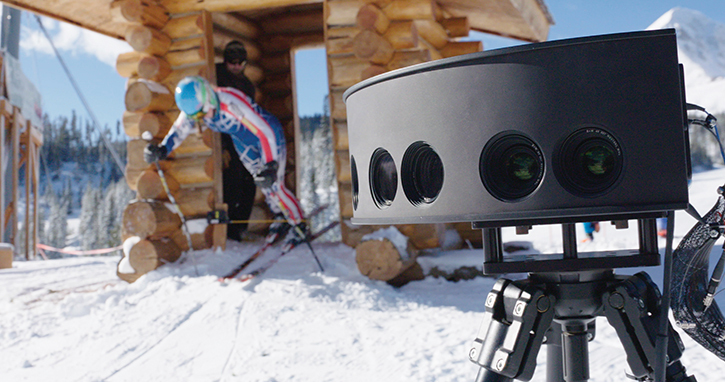 More than 55 hours of live sport coverage from PyeongChang 2018 were produced in VR. “It is no longer just about the quantity of television hours, but more about the type of content, where and when it is available and how it is produced. Storytelling coverage is key to engagement in the digital arena. OBS tried to enhance the second-screen experience, providing broadcasters with additional material for social media, more analytical data, different angles, super slow-motion and 360° replay technology. In Sochi 2014, OBS introduced the Olympic Video Player (OVP), a white-label platform for desktop, tablets and smartphones providing live streaming and video-on-demand for every competition session of the Games. OBS expanded its digital offering for PyeongChang 2018 and delivered individual digital components for RHBs to integrate within their existing digital products. The Olympic Video Player is available in 95 countries and provides fully integrated data, a news channel, live streams and on‑demand video. OBS is also using a range of cloud-based technologies as part of its collaboration and workflow support systems. “The weather in Pyeongchang was the greatest challenge faced by OBS in preparation for the Winter Games.” says Salamouris. “There is no weather insurance! 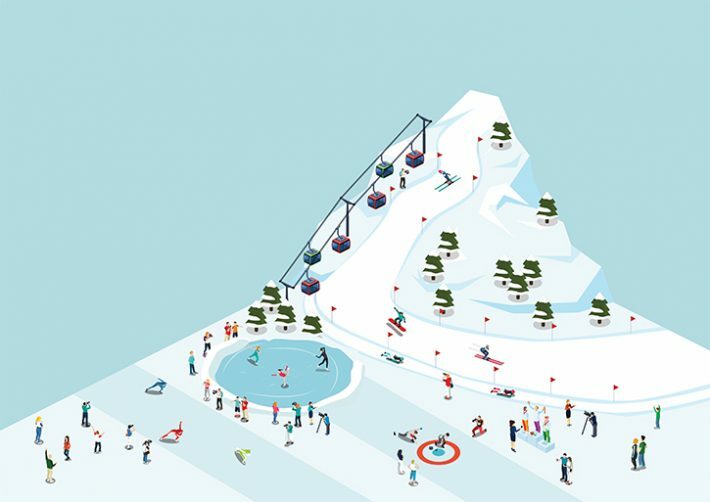 The broadcast operations for the mountain venues needed to take into consideration potential snow, ice and extreme cold, as well as strong winds when designing the coverage plan and the technical installations required. “The venue installations – from cabling to the construction of cable bridges and camera platform towers – started on 1 November and while the weather was relatively mild and the installations were going according to plan all through November, in December, the weather turned much colder. The BBC Sport website is the biggest sport website in the UK and streamed all the key moments from the PyeongChang Winter Games. The BBC has long realised that its online strategy is at least as important as its broadcast plans. The BBC website featured on-demand clips, bespoke highlights, medals tables, schedule and results, live text blogging and reports. The content was responsive across desktops, tablets and smartphones, with mobile at the heart of design and commissioning. Fans could sign up for mobile medal alerts on the app via top stories as well as updates by country. BBC Sport provides content both on its website and through social media platforms including Twitter, Facebook, Instagram and YouTube. Bespoke content and treatments are created for the different platforms and audiences. “We also engaged with fans by providing behind-the-scenes content with BBC presenters and expert analysis from former medallists and Olympians including Jenny Jones, Chemmy Alcott and Robin Cousins, as well as members of Team GB competing in Pyeongchang,” says Anna Thompson, digital lead for the BBC in Pyeongchang. With the Olympic venue on the other side of the world, the BBC used remote technologies as much as possible. These included new remotely controlled audio mixers, operated from the BBC’s Salford studios. The BBC also employed end-to-end IP connectively in its production set-up for all services between South Korea and the UK and deployed its own networks in Korea to facilitate presentation positions. Data, audio and video transmission were reliant on IP connectivity. The BBC broadcast from Pyeongchang between midnight and 9.15am UK time and then switched to the BBC’s Salford studio once it got dark in Korea. Leveraging its biggest sportscasting names – such as Clare Balding and Hazel Irvine – the BBC tries to make as much of a show out of its presenting. “The BBC has adapted its presenter coverage so the viewer gets more of a feeling of being at the event and experiencing the atmosphere,” says Jonathan Bramley, executive producer, major events at the corporation. “This was pioneered by roving radio cameras and Steadicam presentation in 2010 and 2014, and a greater venue presence with ‘announce platforms’ at five events at Sochi 2014. Continuous development from aerial and ground-level tracking cameras to helmet cams and drones, new kit is regularly introduced to enhance the viewer experience. At the end of the Rio Games, OBS launched the Olympic Channel, a multi-platform streaming destination offering Olympics-based content all year round. New material is uploaded daily, and the Channel offers material that complements OBS Olympics coverage. The Channel just launched its first original series, Trending Gold, produced in 360 VR by Jaunt. This article originally appeared in the March 2018 issue of FEED magazine.